Tagged under Namco, A-1 Pictures, Games, Series. Many lovely songs, indeed. Too many charaters, that also right. Its confusing who is the main role, hopes it was Haruka :p she got main role at few last episode. Well honestly i wishing there is more love development between Haruka and Touma, but huh? No romance at the end :[ its will be interesting if they become lover after all the comotions between them. Well fanfiction mode on!!! was a game now an anime. interesting to see the development and little known aspect of how a star is born or rather, created. it's especially interesting when one relate the anime plot to the development of Morning Musume and other girl groups that followed in their foot-steps. All having various level of sucess. the Japanese society... just adores girls culture... maybe they are too masculine and serious in everyday lives. 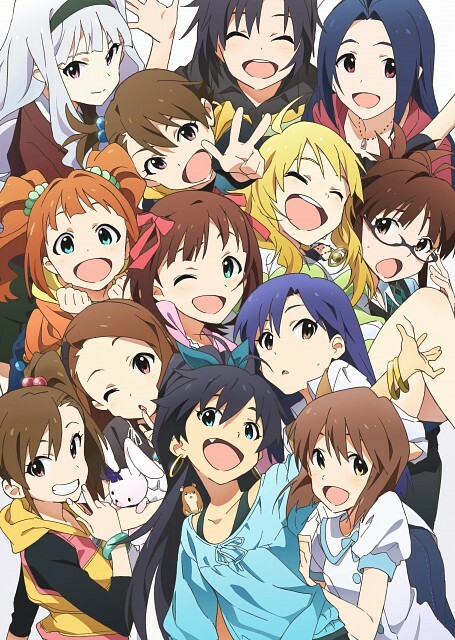 Very funny^^ The different personalities of all the girls makes the show pretty entertaining. Some of the songs are pretty good too. It was nice to see their final performance and to see all the hardships they had to go through and all the hard work they put in to become idols pay off in the end. Keep a beautiful image in mind that you are surrounded by future idols of japan. How does it feels? Well after watching this anime, you are indeed gonna be very envious of the only guy who is there new producer. Now i know what you are thinking, this anime is indeed a harem genere but i assure you that this anime is gonna prove itself in a quite another fashion. Full of fun with extremely good presentation and voice acting, u will be meeting every kind of girl here. Well.. to ll u OTAKUS there.. this anime is a must watch. No feedback on Idol Master.